Lauren Teacher & Cameron Teacher's Last Day! One of the hardest parts about leaving Korea has been leaving my students. I’ve become attached to so many of them. It’s impossible not too! There’s a group of young girls about 8 years old who greeted me each day with hugs, kisses, handholding, and big smiles. They practically attacked me in the halls, everyone pushing and pulling trying to get some attention. They made me feel like a rock star! They love to be loved and encouraged and they returned it tenfold. I will miss them. I’ll miss Jenny and Lucy – the most adorable twins I have ever seen. Every day they dressed alike. Little fashion plates, they belong on the cover of a magazine. With big smiles plastered on their faces, every day the answer to the question, “How are you?” was “I’m happy.” I will miss them. I will miss Kai. He’s a little boy with a big personality who frustrated me on a daily basis. I couldn't help myself. I saw how smart he is and how great he can do if he puts in the effort. So, I pushed him and he pushed back… always with a smile and some mischief in his eyes. I will miss him. These children are special and there are way too many that have touched my heart to name here. Teaching them has been a privilege. I spent so much time with them and outside the classroom thinking about them, that it’s strange to be without them. A week after leaving…I just feel it’s vacation. It’s still not real. When I told students I was leaving, I could see their faces fall with disappointment. Many asked me “When are you coming back?” They didn’t seem to understand why Cameron and I would leave. I’m glad that we helped to make English school enjoyable. More than that, I hope some of these children have felt encouraged and loved by us. Oh yeah, and I hope they grow into being fluent English speakers! So, on our last day, Cameron and I ended a week of goodbyes. We told all our students how to track us down and handed the reigns over to some new teachers. Our amazing staff had a little surprise get together at the end of the day with some yummy goodies, gifts, and farewells. I was a bit emotional. I was able to work with such kind, caring, and hardworking people. It’s not easy to adjust to new teachers year in and year out, but they do it gracefully. Cameron and I are proud and grateful we were able to be part of the team at April School. The April School Team -- They're Great! So, here are A LOT more photos of just some of the faces we will miss! Seed 2 with only 5 students, but energy for 12! Jenny is Always Happy to See You! I was Lucky to Have These Girls in Class! Okay, now it's time to see some photos of Cameron Teacher and his students. Cameron was loved for being silly, fun and creative. It's true...he is very silly. Students Would Line Up and Beg for This Trick! Cameron and I had a wonderful surprise on our last day. A former student of ours who was truly wonderful came back to say goodbye. Tiffany had found out from a staff member that we were leaving and surprised us on our last day. Tiffany travels to Canada soon to practice her English. She's a fantastic student and we know she'll do very well. Finally...just look at these faces! Could you forget them? I didn't think so. Full of energy, creativity, love and sometimes mischief, there are so many faces we'll never forget. I'm certain this was the best commute I've ever had. Door to door it was a 15 minute walk to April School. It was so pleasant and relaxing. So, on my final walk to April School, we made a photo journey of our walk. Esther and Jelly Prepared Posters for Acting Day! Teaching in Korea can be a wonderful experience – it certainly was for me and my husband. Of course a lot depends on where you’re teaching – your school and your neighborhood. English education is very much in demand in Korea and that means small private schools (Korean term is hogwans) are constantly popping up. Some are reputable and others are not. If you’re considering a move, do your research first and speak with other teachers at the school for references. A bad school could mean late salary payments, no severance pay, poor health insurance and poor accommodations along with a bad working environment. So, there you have it – you’ve been warned! Now, let’s assume you’ve ended up at a good, professionally run school like I did. It could be a hagwon, international school or university. Any way you slice it, there are pros and cons. The Students: I taught younger students (ages 6-11) and I loved them. They are affectionate, boisterous, smart, hardworking and full of personality. Some are frustrating and misbehave – after all, they’re children! However, the importance of English education is ingrained in the culture here. Parents are strict. So, I would say children generally do their assignments and homework. It’s not just gratifying to teach these children, but it’s wonderful to have relationships with them and be a source of encouragement in their lives. Teaching Experience: The demand here is for native English speakers. While a college education is required, a degree in education is not. However, for those wanting to try out teaching as a profession or gain more experience, this is a great opportunity. You don’t just learn how to teach English, you learn student management and teaching techniques. I felt very comfortable in the classroom and learned the joys and stresses of teaching in a real environment. The Schedule: The typical teaching schedule is less grueling compared to a typical American workweek of 40+ hours. Of course, each school is different. At a private school, I had two weeks of set vacation plus some holidays off. At a university, you’re looking at close to four months paid vacation. Either way, your work days are about 7 hours or less. Hours differ depending on the schools. I worked afternoons and evenings and that was just fine, because my husband and I were on the same schedule. 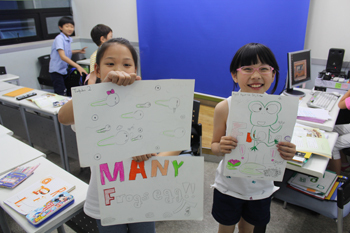 The Experience: This is the opportunity that teaching in Korea affords you. It’s the opportunity to experience living and working in another country. You get to tour Korea! You can meet interesting people. You’re on the other side of the world – so go and visit China; it’s only an hour flight! Little things like eating out and applying for your driver’s license become an adventure. Money: I don’t think any of the teachers here are going to brag about their salaries. It’s not a lot of money. However, with free housing provided and low expenses in Korea, you just may end up with a nice savings. Some come here to pay off debt and others use their savings to travel. Cultural Differences: I wanted to experience the Korean culture – there’s so much to appreciate. However, cultural differences in the workplace can be frustrating. Last minute decisions are a big sticking point with Westerners. This will affect your schedule, working hours, vacation time, and work responsibilities. Planning ahead is not a priority. Here’s one more example: It’s important for Koreans to “save face.” That means criticism or workplace problems are not always dealt with head on. It can lead to confusion on the part of Westerners – the feeling is that issues are not dealt with honestly. Even when you understand the culture, it can be frustrating at times. However, you must remember that you are in Korea working with Koreans – it is up to you to adjust and not the other way around. Changes, Even With a Contract: Your expectations and your school’s expectations may not be the same. You have a contract and you think you understand that contract, but there are likely exceptions and misunderstandings that go against your expectations. For example, when examining your required hours, realize there’s a difference between “working hours” and “teaching hours.” You may be paid for only teaching hours, although your working hours are longer. A word of advice to prospective teachers: This is not a free ride. If you decide to teach in Korea, you should behave as a professional. Too many teachers act immaturely and irresponsibly. Not only are you impacting your school, you’re a poor ambassador for other Westerners and teachers. I can wholeheartedly recommend teaching in Korea. I enjoyed my job, the country and the people. I enjoyed the travel around Asia. My stay was short term – just a year, but there are many others who make a life for themselves in Korea. They’re romanced by good jobs and a good lifestyle. You may be too! Our time in Korea is just about up. We have 6 more days of teaching, 8 full days left in our apartment in our lovely little neighborhood. So essentially there’s a week left of life as we’ve known it for the past year. Change, even when you’ve chosen it, is always a little bit difficult. We’ve thoroughly enjoyed our lifestyle and experiences while living in Korea. There are no complaints. However, it’s still time to go home to be with family and start the next chapter of our lives. However, before we do that, there’s still one more thing to check off our list – our “Big Trip.” At least, that’s what we’ve dubbed it! After a week touring Southern Korea and a few days spent with family here, it will begin. Our tour of China and Southeast Asia (Vietnam, Cambodia, Laos, Thailand, & Malaysia) begins on July 4th. This is going to be a whole new experience. We’ve never traveled like this before – for months, with one big backpack each (packing light…preparing to do laundry), and with only loose plans to guide us. We’ve never had the luxury of time to do something like this, and it’s exciting. The biggest itch I’ve ever had was to see the world – to travel anywhere and everywhere. I want to see it all, try new things (except bizarre foods), meet different people, lie on different beaches, learn about other cultures, and see unique landscapes. I’m so excited to see things I’ve only read about in books. And after it’s all said and done – I’m certain I’ll be overwhelmed and exhausted and so excited to return home. We just booked our ticket…and already it seems too far away. I’m just lucky, there’s so much to look forward too!